The Southeastern Africa countries of Mozambique, Malawi, and Zimbabwe experienced catastrophic flooding after a cyclone hit the coast last month. This event is being called one of the worst natural disasters the area has experienced. Cleveland, TN–In his thrust to celebrate the Jeremiah Generation and the passing of ministry mantles, General Overseer Tim Hill is inviting parents and children called to the ministry to pray the invocation at the monthly gatherings of the Church of God Executive Committee. The International Youth and Discipleship department held a special “Orphan Run 4 Hope” event on Saturday, March 9, as part of Smoky Mountain Winterfest in Knoxville, Tenn. The Run took place at the Smoky Mountains Children’s Home in Sevierville, Tenn. The International Department of Youth and Discipleship for the Church of God has offered two global training missions trips thus far this year. Coordinated by Tony Lane, the teams on these trips include children’s pastors, youth pastors, worship pastors, evangelism/outreach pastors, lead/senior pastors. Cleveland, TN—The Lee University School of Nursing program was recently ranked #1 in the state of Tennessee by RegisteredNursing.org, a national organization dedicated to advancement of the profession of nursing. Dorothy Jennings Roberson, a former director of Ladies Ministries and one of the Church of God’s most influential women’s leaders, reached the milestone of her 100th birthday on March 25. Frontier Kidfest is the first event of the 2019 Kidfest season and will take place at the Westin Hotel in Irving, Texas April 5-7, 2019. Children’s ministry leaders from churches in Texas, New Mexico, Louisiana, South Central Hispanic Region and the Heartland Region will take their groups to Kidfest for a weekend encounter with the Holy Spirit. The weekend includes four dynamic church services designed just for kids and geared to their liking. According to Lane, Kidfest 2019 will be bigger and better than ever before. With the theme, ‘GO BEYOND,” each venue will focus on helping children understand the importance of the meaning of Ephesians 3:20. The guest speaker line-up includes Kidfest favorites: B-Shoc, Anointed, The CREW and more. Remix will again be providing pre-service programming. An addition this year is Josh Denhart, who will share teaching with scientific experiments. David Laflin will minister with illusions. Yoly Pacheco, a ventriloquist, will minister in Spanish and English. Chagy, a crowd favorite, will be also be involved in Frontier Kidfest. Carolina Kidfest, April 12-14, will once again be held at the Charlotte, N.C. Renaissance Suites Hotel. Midwest Kidfest, April 26-28, is set for the Great Wolf Lodge in Mason, Ohio, where space is limited and the cost includes a 3-day admission to the indoor waterpark, as well as the four services. For the eighth consecutive year, Smoky Mountain Kidfest, May 3-5, will convene at the Gatlinburg Convention Center, an earlier site of Winterfest, it’s teenage counterpart. At this location, each group may secure their own lodging. Lodging recommendations, registration, and rooming list forms are all available on the www.mykidfest.com website. For a brochure or for more information, call 423-478-7229, email [email protected], or visit www.mykidfest.com. Cleveland, TN–The upcoming 2019 Ministerial Internship Program (MIP) Commissioning Celebration marks a special time in the history of MIP as the celebration will feature the 40th Anniversary. The services will be conducted at the North Cleveland Church of God on May 17 and 18, 2019. Rev. Tony Lane, coordinator of Children’s Ministries, was recently honored by the Youth and Discipleship Department of the Church of God. 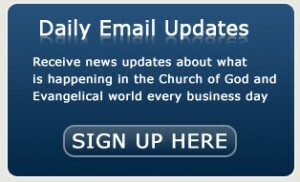 Copyright © 2009 Faith News Network. Powered by Winters Technology Group.